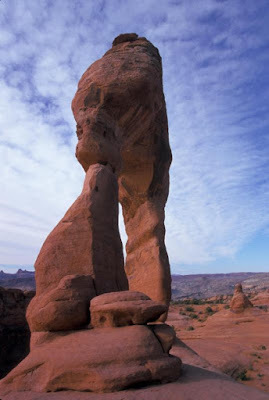 Arches National Park is a US National Park in eastern Utah. 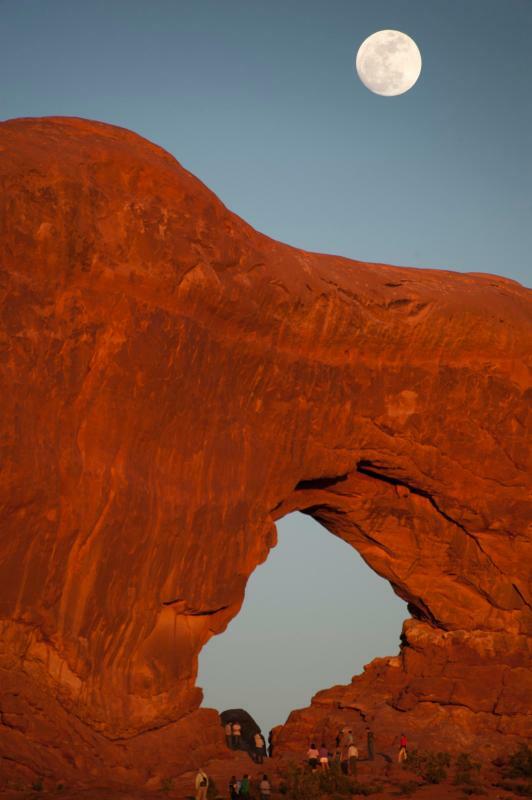 The park is located on the Colorado River 4 miles (6 km) north of Moab, Utah. It is known for containing over 2,000 natural sandstone arches, including the world-famous Delicate Arch, in addition to a variety of unique geological resources and formations. 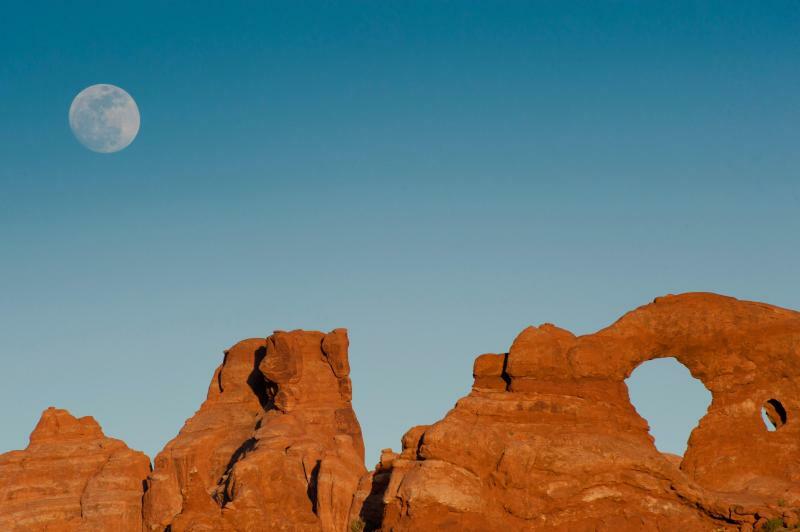 The park is located just outside Moab, Utah, and is 76,679 acres (119.811 sq mi; 31,031 ha; 310.31 km2) in area. 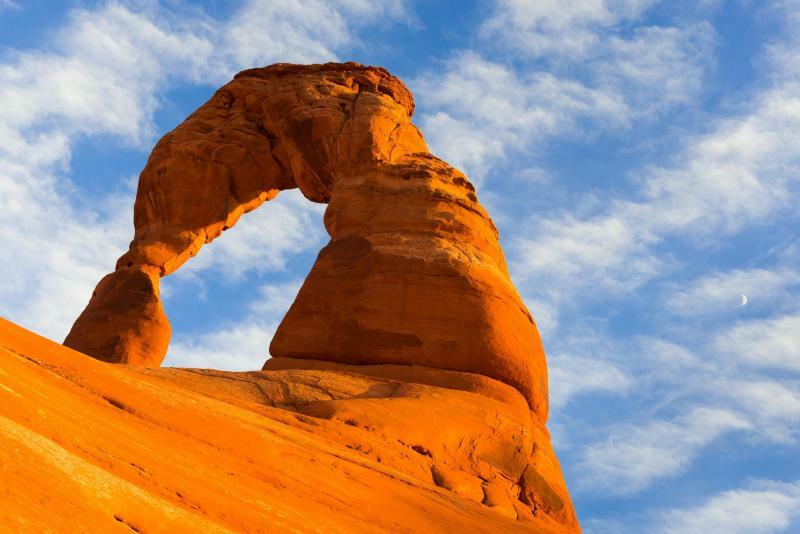 Its highest elevation is 5,653 feet (1,723 m) at Elephant Butte, and its lowest elevation is 4,085 feet (1,245 m) at the visitor center. Forty-three arches are known to have collapsed since 1977. The park receives 10 inches (250 mm) of rain a year on average. 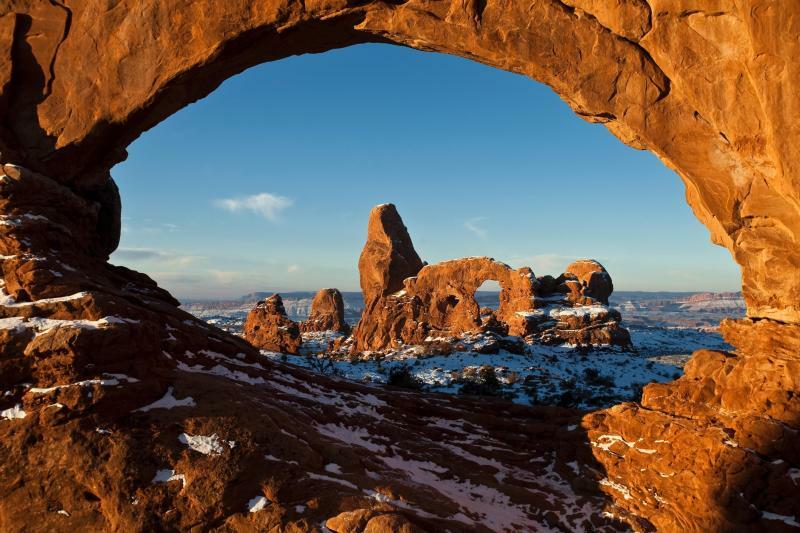 Administered by the National Park Service, the area was originally named a National Monument on April 12, 1929. 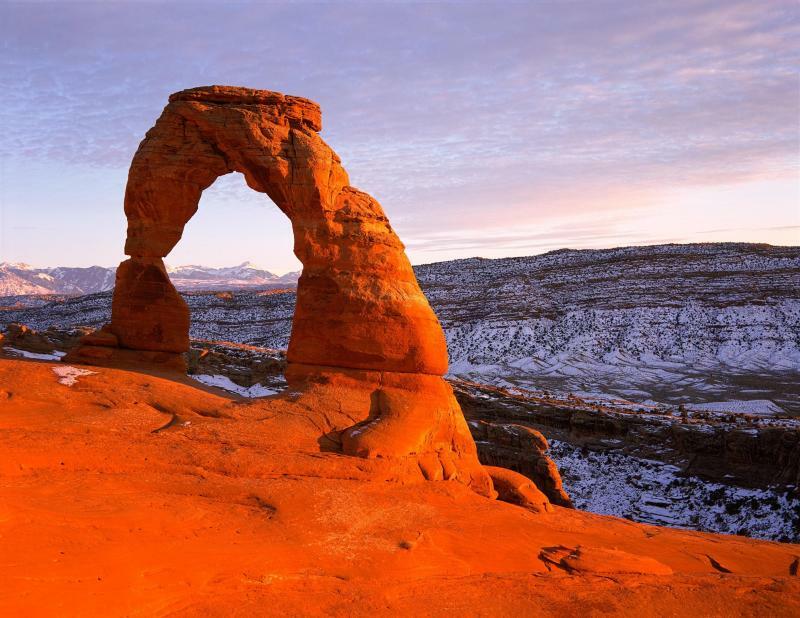 It was redesignated as a National Park on November 12, 1971. The national park lies atop an underground evaporite layer or salt bed, which is the main cause of the formation of the arches, spires, balanced rocks, sandstone fins, and eroded monoliths in the area. This salt bed is thousands of feet thick in places, and was deposited in the Paradox Basin of the Colorado Plateau some 300 million years ago when a sea flowed into the region and eventually evaporated. Over millions of years, the salt bed was covered with debris eroded from the Uncompahgre Uplift to the northeast. During the Early Jurassic (about 210 Ma) desert conditions prevailed in the region and the vast Navajo Sandstone was deposited. 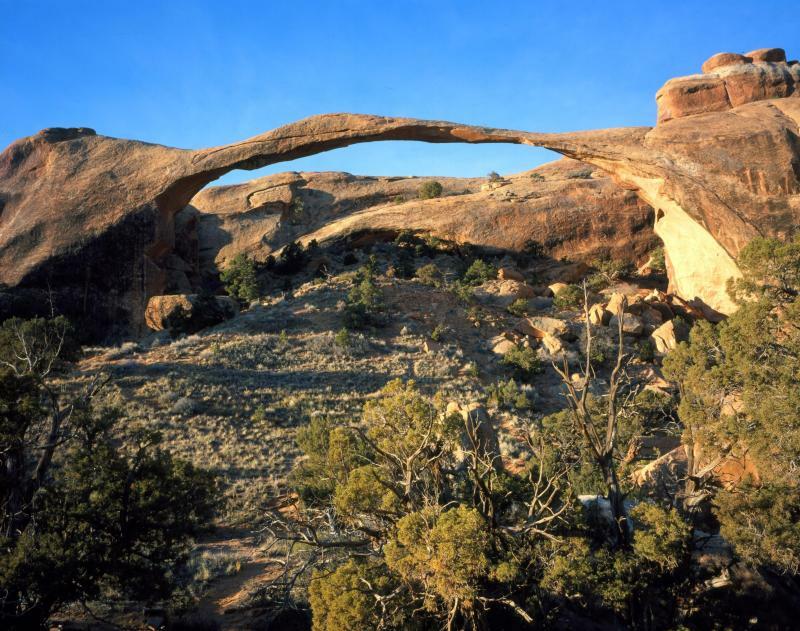 An additional sequence of stream laid and windblown sediments, the Entrada Sandstone (about 140 Ma), was deposited on top of the Navajo. Over 5000 feet (1500 m) of younger sediments were deposited and have been mostly eroded away. Remnants of the cover exist in the area including exposures of the Cretaceous Mancos Shale. 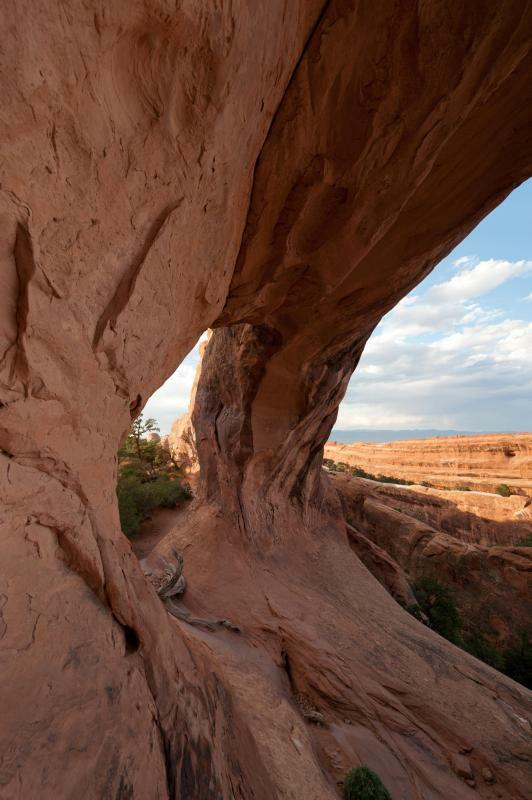 The arches of the area are developed mostly within the Entrada formation. The weight of this cover caused the salt bed below it to liquefy and thrust up layers of rock into salt domes. The evaporites of the area formed more unusual salt anticlines or linear regions of uplift. Faulting occurred and whole sections of rock subsided into the areas between the domes. In some places, they turned almost on edge. 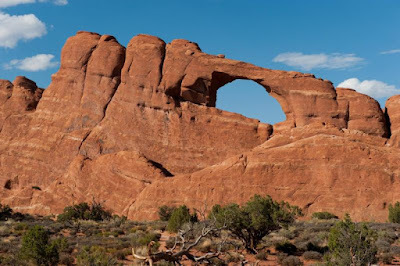 The result of one such 2,500-foot (760 m) displacement, the Moab Fault, is seen from the visitor center. As this subsurface movement of salt shaped the landscape, erosion removed the younger rock layers from the surface. Except for isolated remnants, the major formations visible in the park today are the salmon-colored Entrada Sandstone, in which most of the arches form, and the buff-colored Navajo Sandstone. These are visible in layer cake fashion throughout most of the park. Over time, water seeped into the surface cracks, joints, and folds of these layers. Ice formed in the fissures, expanding and putting pressure on surrounding rock, breaking off bits and pieces. Winds later cleaned out the loose particles. A series of free-standing fins remained. Wind and water attacked these fins until, in some, the cementing material gave way and chunks of rock tumbled out. Many damaged fins collapsed. Others, with the right degree of hardness and balance, survived despite their missing sections. 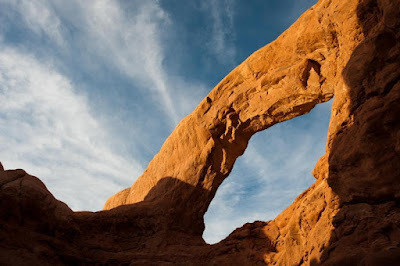 These became the famous arches. 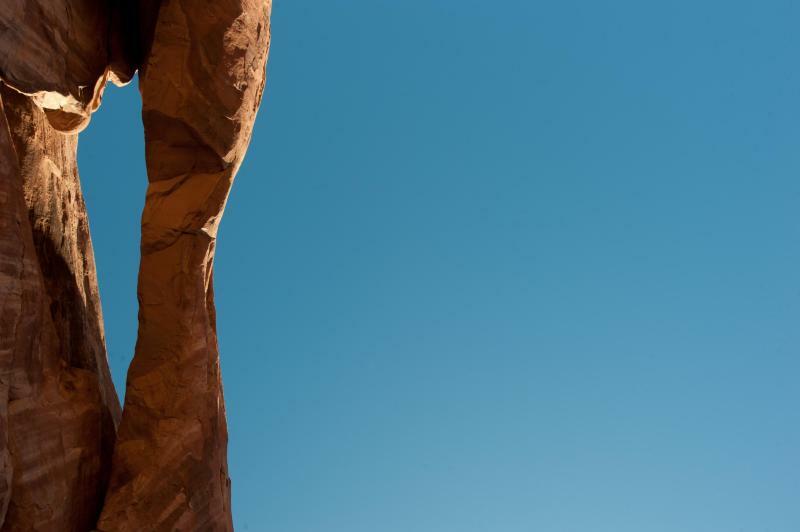 Although the park’s terrain appears rugged and durable, it is the exact opposite. 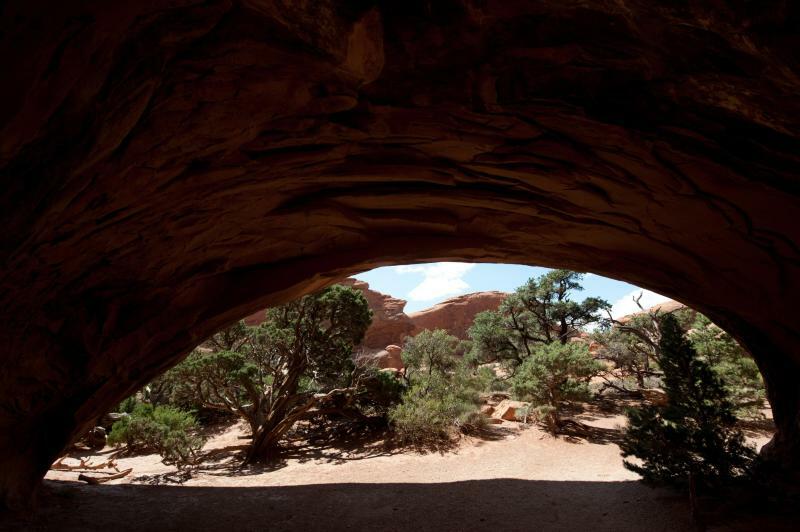 More than 700,000 visitors each year threaten the fragile high desert ecosystem. 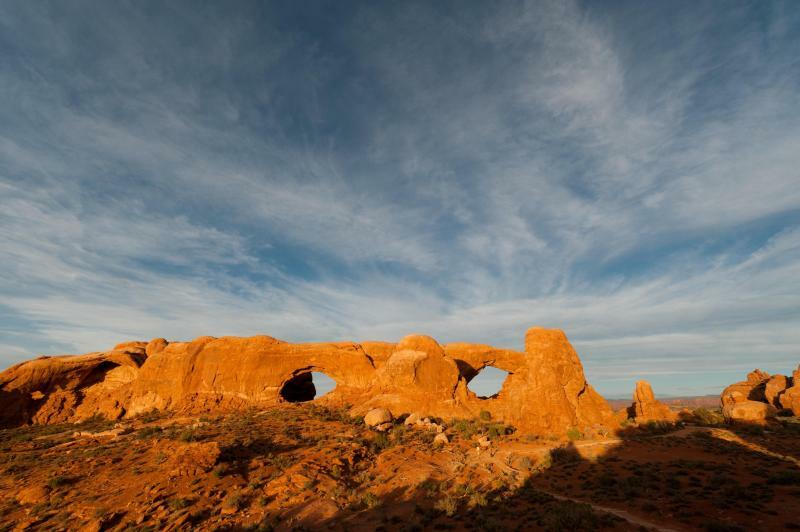 The problem lies within the soil’s crust which is composed of cyanobacteria, algae, fungi, and lichens that grow in the dusty parts of the park. 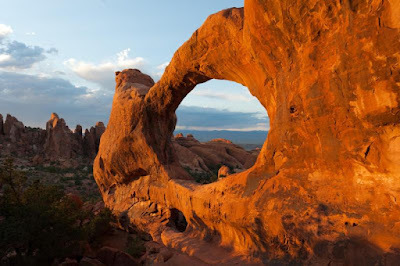 Factors that make Arches National Park sensitive to visitor damage include: semiarid region, and the scarce, unpredictable rainfall, lack of deep freezing, and lack of plant litter which results in soils that have both a low resistance to, and slow recovery from, compressional forces such as foot traffic. Methods of indicating effects on the soil are cytophobic soil crust index, measuring of water infiltration, and t-tests that are used to compare the values from the undisturbed and disturbed areas. Could Carbon Dioxide Be Injected in Sandstone?